The Chapel takes its name from the fact that the Liturgy of the Hours are celebrated here. The mosaic commemorates the Definition of Mary's Immaculate Conception. Its design was traditionally attributed to Giacomo della Porta (1540-1602), but today it is thought to be the work of Carlo Maderno. It owes its name to the fact that the canons of the basilica used to celebrate the Liturgy of the Hours here as a choir. The gate of the chapel, usually closed, is of exquisite workmanship. The vault of the chapel, divided by four Corinthian pilasters, is decorated with fine gilded stucco ornaments on a white background, showing the Creation, the Crossing of the Red Sea, the Baptism of Jesus. In the dome are the Vision of the angels and the Elect of the Apocalypse. 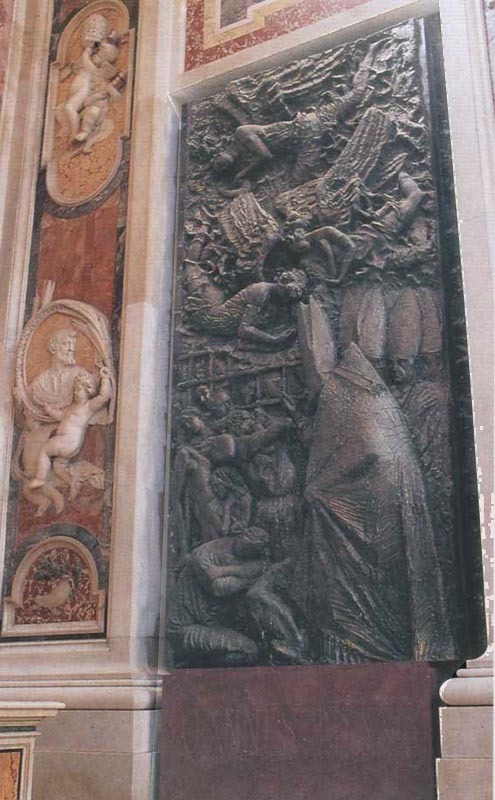 In the vault are shown: Habakuk and the angel, Daniel in the lions' den, David, Jonah inside the whale. In the lunettes, Deborah and Barak, Judith with Holofern's head, Moses and Aaron, Ozaziah and Uzziah and Jeremiah. The dark wooden choir against the walls has a triple row of stalls, adorned with magnificent bas-reliefs and decorations; above it on each side are two historical organs. We next enter the magnificent and sumptuous Cappella del Coro, decorated with precious marble, its walls and vault covered with golden embroidery. The stuccoes of the roof, which illustrate the most important events of the Old and New Testaments, were executed by G. B. Ricci from the design of Giacomo della Porta. The choirstalls are a true masterpiece of the art of intaglio, although the work is little known because of poor lighting, which makes it difficult to see. 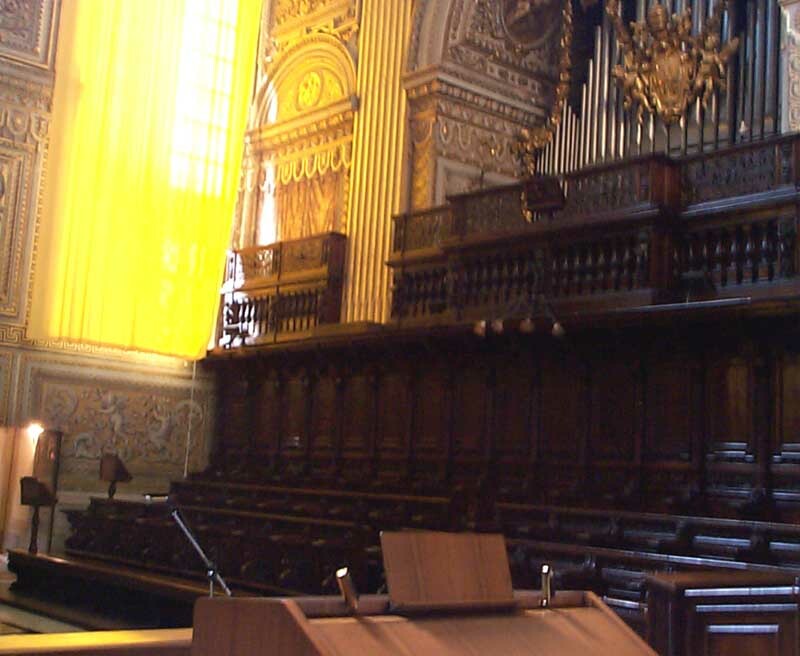 The choir is the work of G. B. Soria, who was paid 15, 251 scudi for it. 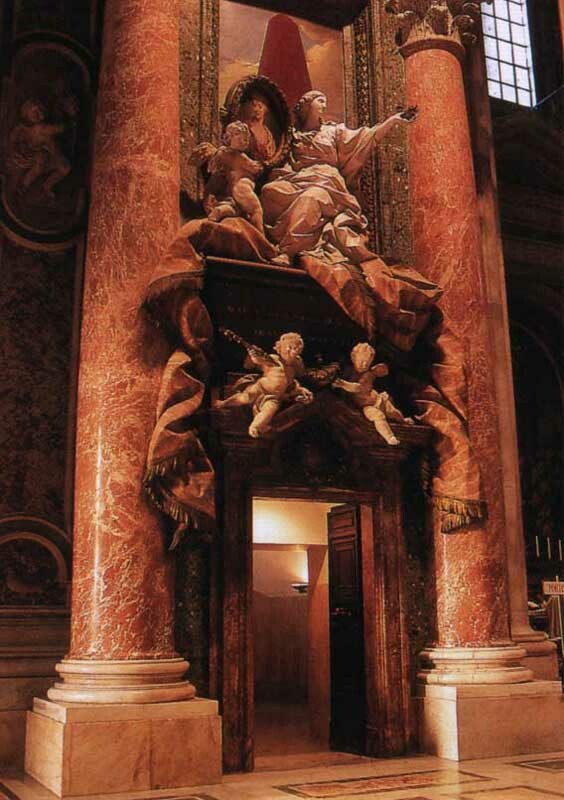 The previous Choir Chapel, built by Sixtus IV, contained Michelangelo's Pieta from 1505 to 1604. 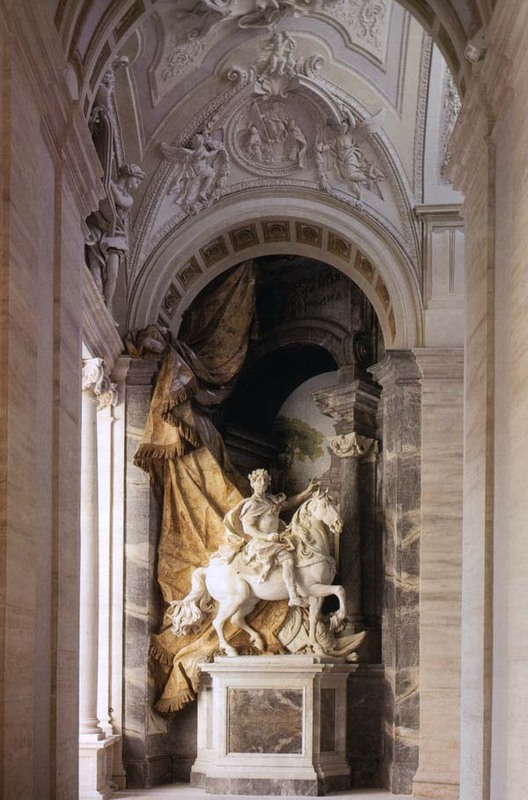 Like the corresponding chapel of the Blessed Sacrament on the other side of the Basilica, this chapel is enclosed by an enormous gate, bearing the arms of Clement XIII. It is one of the first known works of Borromini. Four great arches compose the chapel; on them are placed decorative figures of the style of Bernini, with their legs suspended in the air. 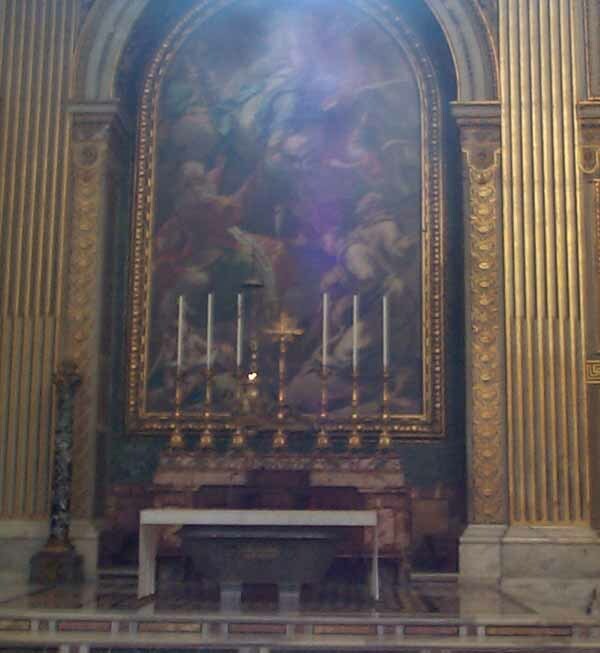 Above the altar is a large mosaic with shining colours and of theatrical composition; reproduced from a unfinished painting of Pietro Bianchi (1740), it portrays the glory of Mary Immaculate. 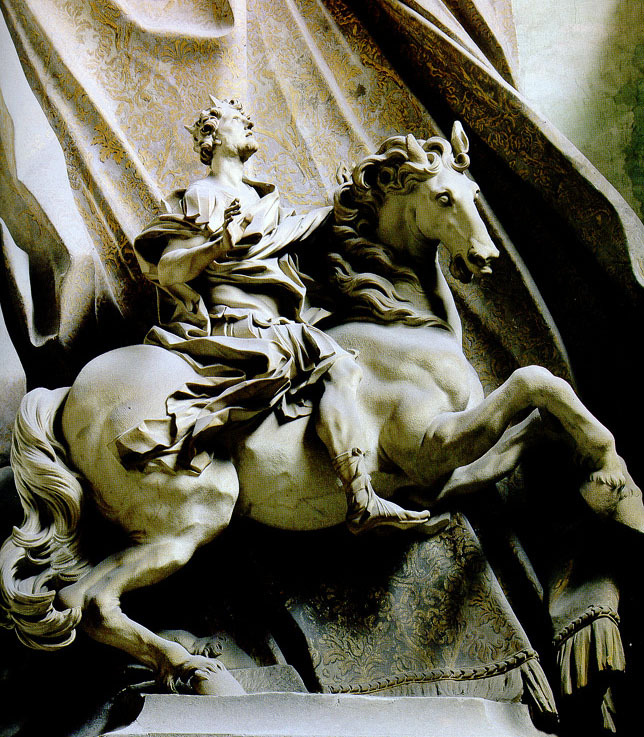 The figure of the Virgin was crowned by Pius IX with a diadem of nine stars made of gems, after the definition of the dogma of the Immaculate Conception. Our tour then takes us under the oval cupola in front of the Choir Chapel, closed by an iron, bronze and glass gate designed by Bernini and bearing the arms of Clement XIII. It is made up of a large rectangular space opening off the outside of the aisle, in the same position as the Holy Sacrament Chapel on the opposite side. Urban VIII, whose heraldic bee can be seen in a frieze, finished decorating it and consecrated it in 1627. The space is set out between four large arches, enclosed by eight Corinthian pillars supporting a pediment with an open curved tympanum. Of these arches, one serves as an entrance, the one opposite houses the altar with the mosaic altarpiece depicting the "Virgin and Saints" from an original drawing by P. Bianchi; in the other two are the two large organs, each accompanied by two small choirs, constructed in 1626 by Cerricola, but rebuilt using modern techniques by Morettini and later by the Walcker firm of Ludwigsburg. 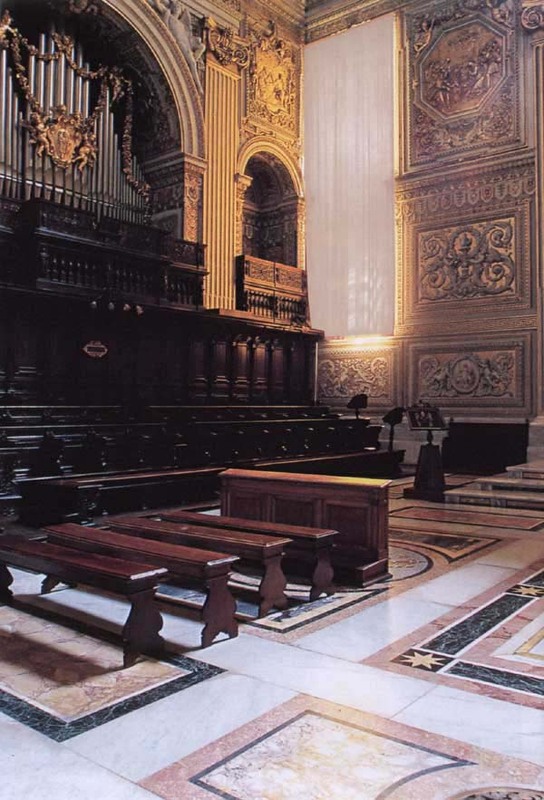 The space at the sides is occupied by the magnificent choirs with three rows of seats, decorated with bas-reliefs and sculptures in the style of Bernini, which were commissioned by Urban VIII. There are three rows because there are three ranks of clergy - canons, incumbents and incumbent priests - who sing the praises of the Holy Trinity in chorus. Here the Gregorian chants accompanying the daily services held in this chapel, known for this reason as the Choir Chapel, are sung. 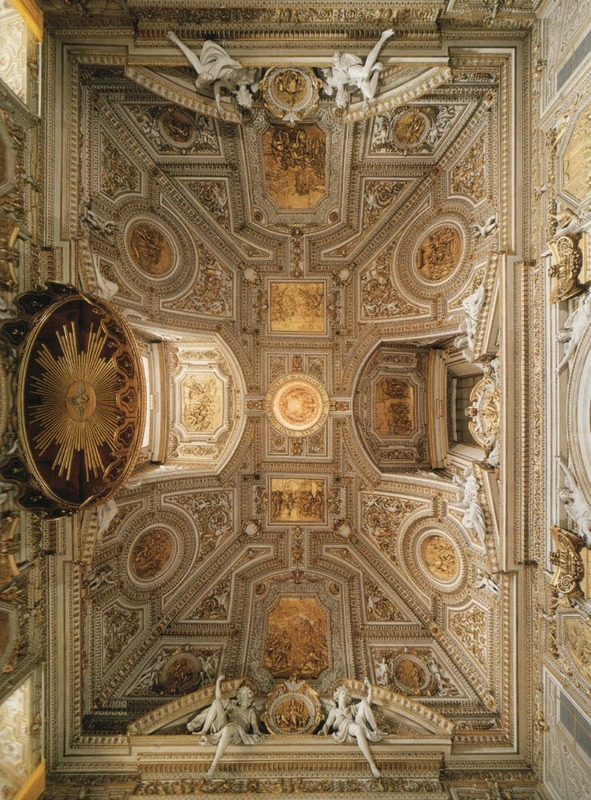 Its walls and quadrangular vault, upon which the dome rests, are covered by the richest decorations in the Basilica, executed with gilded stucco on a white background by G. B. Ricci to drawings by G. Della Porta. 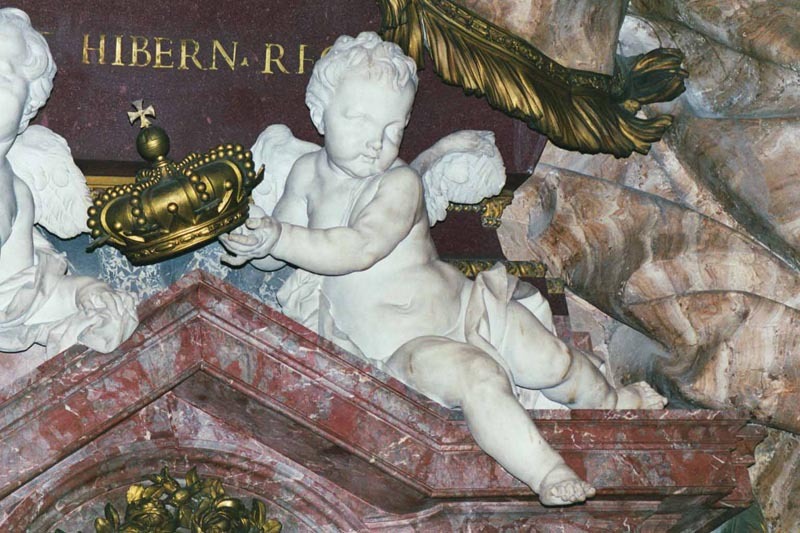 Significant facts from the Old and New Testaments, from the Creation to the Baptism of Christ are illustrated within splendid cornices sustained by small putti and alternated by medallions representing Faith, Religion and the Church. 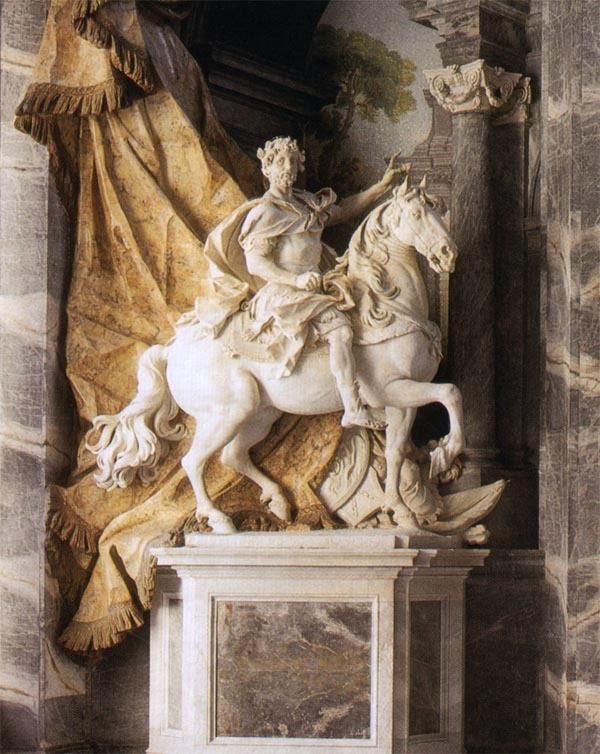 In this very rich Chapel, it is worth mentioning the oriental white and black marble column with its porphyry plinth and gilded bronze base and capital, which serves as the Easter candle and was donated by Pius VI. It should also be mentioned that from 1622 to 1749 it housed Michelangelo's Pietà, which had already been housed in the earlier Sixtus IV Chapel from 1560 to 1609. Outside the Chapel, we can admire the fine mosaic decoration of the elliptical cupola of the bay, which refers to the offering of sacrifices and praises raised to the Almighty by the Ministers of the Sanctuary. Within the dome itself is a Vision of the Apocalypse, with the Angels, the Chosen and the four animals of the tetramorph, who adoringly surround the throne of the Eternal Father. 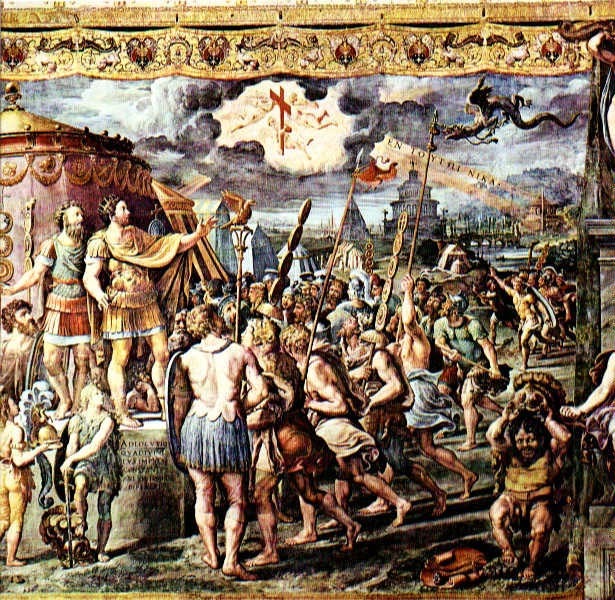 Its author was M. Franceschini, its mosaicist F. Cocchi. The corbels illustrate the four cantors of the divine glories: Daniel and Habbakkuk by C. Maratti, David and Jonah by C. Ferri, transformed into mosaic by G. Conti. The lunettes show the great canticles of praise and victory and of sorrow from the Old Testament: based on cartoons by Ricciolini, Moses in the Desert and Samuel reproaching Saul; on cartoons by Franceschini, Judith with Holofernes' head, the prophetess Deborah under a palm, Deborah again with Barsac the general and Jeremiah weeping over the Holy City. 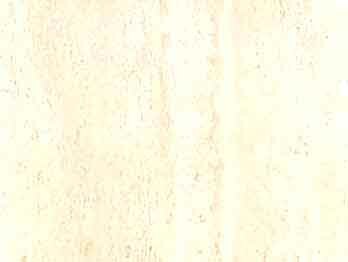 The mosaicist was Giuseppe Ottaviani. 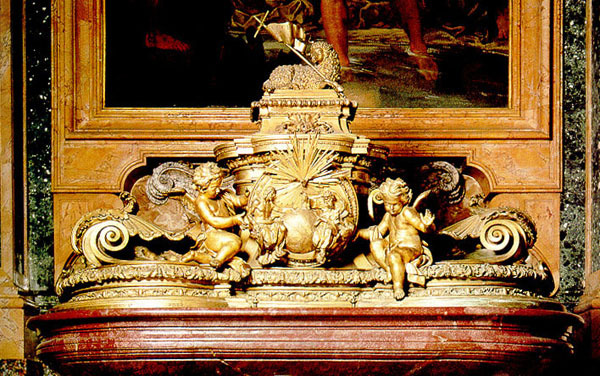 It is enclose by an iron, bronze and crystal gate made by Giuseppe Giardoni in 1758 replacing that realized by Borromini in 1627. 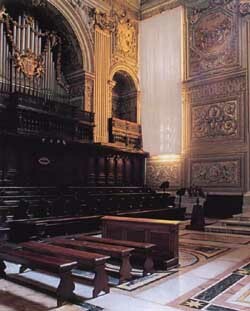 It is mainly used for the clergy's choral liturgy of the Basilica. Their prayers have been held here since the 5th century: first by monks and then, after 1000 A.D., by the Canons. Until the middle of this century the clergy met every day to sing the Canonical Hours established by the Church: Matins, Lauds, Prime, Terce, Sext, None, Vespers, and Compline. 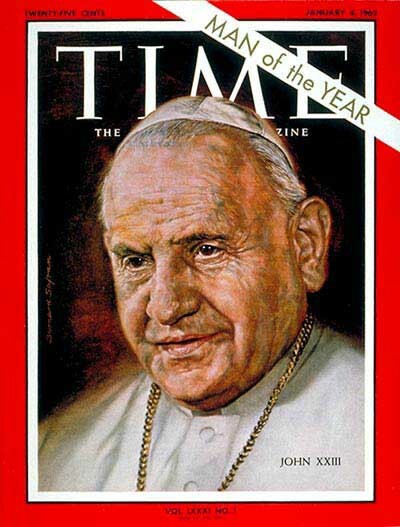 Now they are held on Sundays and feastdays. 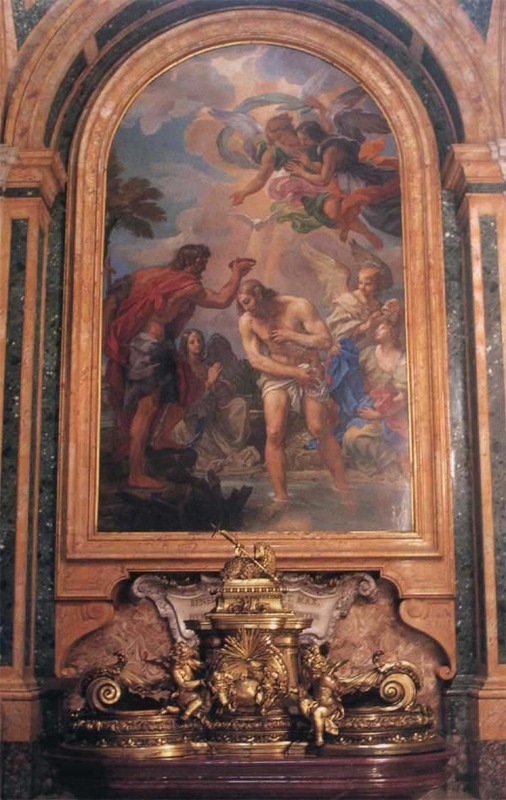 Urban VIII commissioned many works to have the chapel completed: the reorganization of the presbytery and the altarpiece with the first image of St John Crysostom commissioned to the French painter Simone Vouet (1590-1649). 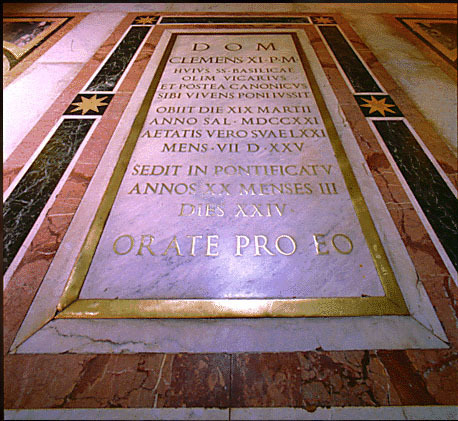 The new presence was linked to the consecration of the new altar, celebrated on July 22, 1626, during which Cardinal Scipione Borghese placed the relics of St John Crysostom - brought to Rome from Constantinople during the Middle Ages - in a 2nd century black and white granite sarcophagus situated under the altar. 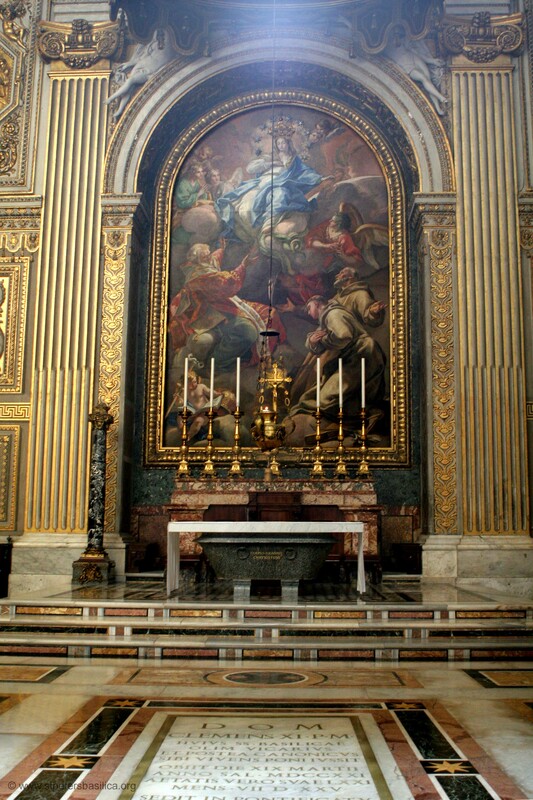 In 1735-36 the Congregation of the Reverenda Fabbrica commissioned a new canvas to the painter Pietro Bianchi to renew the ancient dedication of the chapel to the Immaculate Conception decided by Sixtus IV and also to link it to its location decided by Urban VIII. It represents the Immaculate Conception with St Frances, St Anthony of Padua and St John Crysostom. 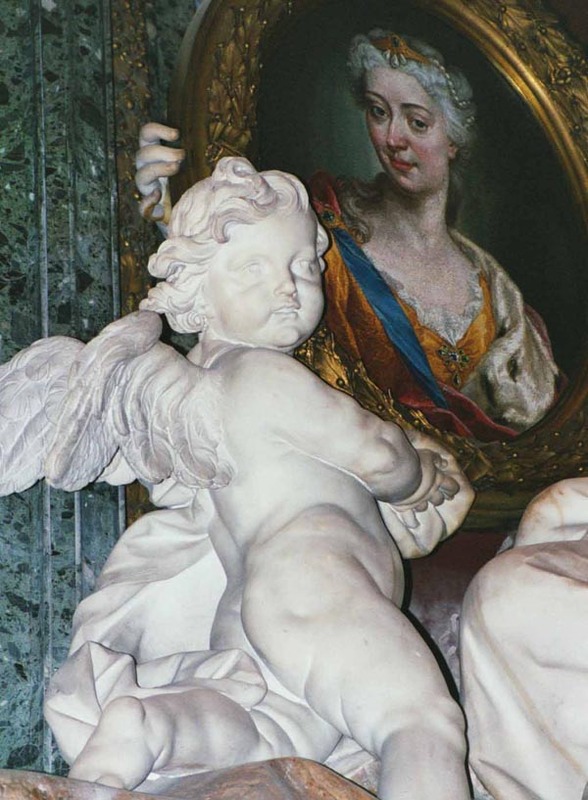 Bianchi was an exponent of the Roman rococo and he worked at the painting withe some interruptions. At this death, in 1741, the canvas was "painted but not completed". Although it was incomplete, it was placed over the altar, as the part still to be painted was hidden by Michelangelo's Pietà, at that time set over the altar. In 1744 the Congregation decided to realize in mosaic the work by Bianchi, commissioning the bottom part of it to the apprentice Gaetano Sardi and moving the painting into the Basilica of St Mary of the Angels. 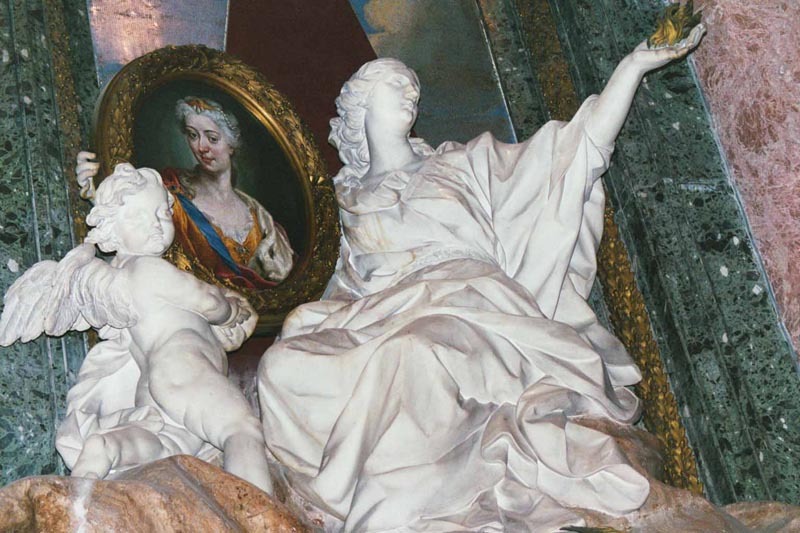 After having moved the Pietà into the present chapel, on December 3, 1749, the mosaic copy was ready for the Jubilee of 1750.